Apple’s all-in-one desktop Mac gets a boost in performance. Following Monday’s news of new iPads, Apple on Tuesday revealed upgrades for its iMac lineup, featuring eighth-generation Intel Core processors in the standard configurations, with the option to upgrade to a ninth-generation processor. The price points of the standard configuration models remain unchanged. Apple is currently taking orders from the new iMac, but it won’t ship or be available in the Apple Store until next week. Apple has three standard configurations of the 21.5-inch iMac, and Apple is changing two of the three configurations. The $1,099 iMac stays the same, with a seventh-generation 2.3GHz dual-core Intel Core i5 processor, 8GB of memory, a 1TB hard drive, Intel Iris Plus Graphics 640, and a 1920x1080 display. The new $1,299 iMac features an eighth-generation 3.6GHz quad-core Intel Core i3 processor, 8GB of memory, a 1TB hard drive, 2GB Radeon Pro 555X graphics, and a Retina 4K P3 display. The new $1,499 iMac also has an eighth-generation 3.0GHz Intel Core i5 processor, but this model supports 6-core processing, a first for the 21.5-inch iMac. This iMac also includes 8GB of memory, a 1TB Fusion Drive, 4GB Radeon Pro 560X graphics, and a Retina 4K P3 display. 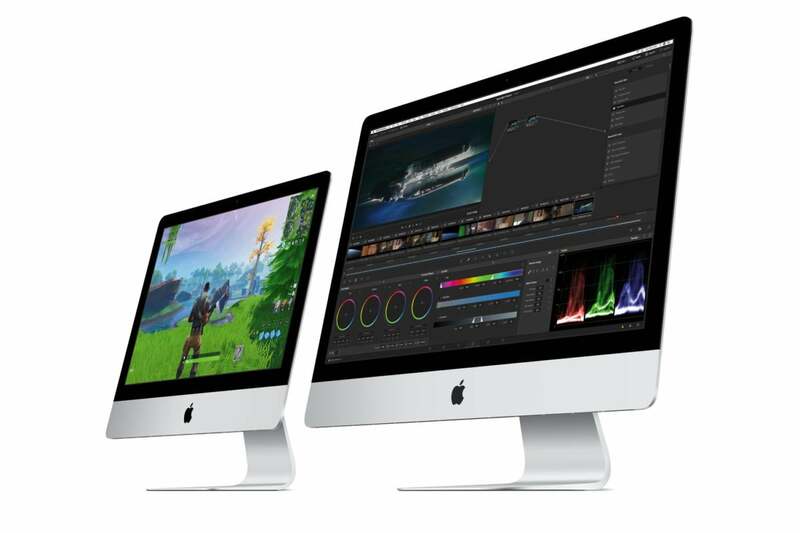 A new option for the 21.5-inch iMac is the ability to upgrade the graphics card in the $1,499 iMac to a 4GB Radeon Pro Vega 20, which the company says is 80 percent faster than the previous graphics card. This upgrade adds $350 to the price. While the standard memory configuration remains unchanged at 8GB, Apple is now using faster RAM clocked at 2666MHz, up from 2400MHz. Also, the 21.5-inch iMac can now handle 32GB of memory, up from the previous limit of 16GB. The RAM is still not user-accessible, so if you want more than the standard 8GB, you either need to customize the RAM at the time of your order, or bring in the iMac to be serviced for a memory upgrade later. The 21.5-inch iMac comes with four USB 3 ports, two Thunderbolt 3/USB-C ports, a gigabit ethernet connector, a SDXC card slot, and a headphone jack. Apple offers three standard-configuration models of the 27-inch iMac, all of which feature Retina 5K displays. All of the CPUs in the standard configurations are getting two more processing cores, jumping from four cores to six. 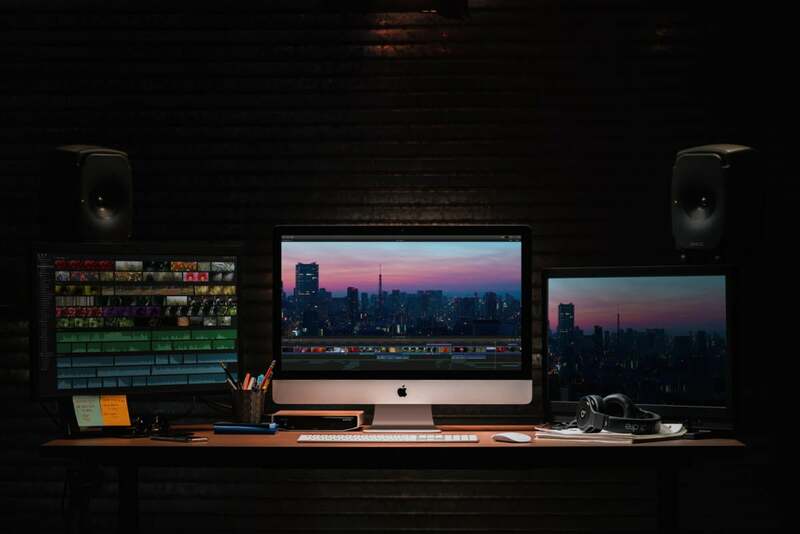 The $1,799 27-inch iMac features an eighth-generation 3.0GHz 6-core Core i5 CPU, 8GB of memory (32GB max), a 1TB Fusion Drive, and 4GB Radeon Pro 570X graphics. The $1,999 model has an eighth-generation 3.1GHz 6-core Core i5 processor, 8GB of memory (64GB max), a 1TB Fusion Drive, and 4GB Radeon Pro 575X graphics. The $2,299 iMac has a ninth-generation 3.7GHz 6-core Core i5 CPU, 8GB of memory (64GB max), a 2TB Fusion Drive, and 8GB Radeon Pro 580X graphics. For the $1,999 and $2,299 iMacs, Apple has available a CPU upgrade to a ninth-generation 8-core Core i9 processor. The $2,299 iMac has available a graphics upgrade to an 8GB Radeon Pro Vega 48. The 27-inch Mac’s rear panels sports four USB 3 ports, two Thunderbolt 3/USB-C ports, a headphone jack, an SDXC card slot, and a gigabit ethernet connector. Apple didn't announce a major update to the iMac Pro (which was released in December 2017), but it did release a couple of new upgrade options. Apple now has a 256GB RAM upgrade available for the iMac Pro, which adds $5,200 to the $4,999 base price. Apple also has a Radeon Pro Vega 64X with 16GB of HBM2 memory graphics upgrade available for an additional $700.